There are thousands of homes on the market that will catch your eye, but only a few that will be the prime choices for your new home. One big mistake that some homeowners make is that they purchase their dream house without having it properly inspected first. Many decide that the appraisal of the home was done to cover every inch of the home and by that it is up to their standards. This is a huge mistake that could end up becoming very costly. Inspections of the structure of the home are done to help accurately appraise it, or give it a value for the current market. However, this may or may not include a full inspection of the plumbing and main pipes connecting to the house’s plumbing system. Before signing your name on that line to purchase your new home, be sure that you have your own licensed professional venture out and inspect the plumbing underneath, the main line connected to the house system, each pipe within the home and connectors, and the hot water heater. If an inspection is not completed, small issues that could lead to bigger problems may exist, such as a clog that occurs in the connecting area between the town or city’s pipe and the home plumbing pipes. Broken pipes, or pipes that are deteriorating could later cause the pipes to collapse, leaving the new homeowner responsible for replacing pipeline. When you move into a new home, you are not entirely sure how old the current hot water heater is, unless you were given that specific information upon purchase. Even then, confirming that the hot water heater is in good shape is still recommended, as there are many things that can assist the hot water heaters deterioration. A hot water heater is a very expensive fix. 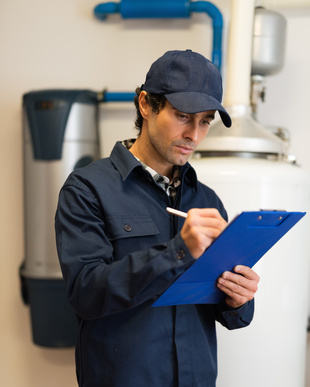 In fact, on top of the price of a new hot water heater, in some states a plumbing permit is needed and that includes extra expenses such as time and the permit fee. Hiring a licensed professional to come out and inspect the plumbing of a house you are considering purchasing is recommended for anyone in the market looking to buy a new home. If you have recently purchased a home, having someone come out and inspect it can catch any issues that you may have. It is better to have a plumber fix the small problems now, than to wait until they are much bigger and more expensive problems.